For the 2015-2061 academic year ISA will also award a $1000 “Bill Latham” scholarship in his honor. Bill was former president of the Iowa Seed Association, the American Seed Trade Association (ASTA), and Independent Professional Seed Association (IPSA) and former president of his family company, Latham Seed Company. Bill passed away on July 31, 2015. Recipients of the Iowa Seed Association 2015-2016 academic year scholarships are: Rebekah Arnold, Kelsey Baumhover, Anthony Moellers, Jamie Pokorny, Lucas Roberts, Sarah Striegel, and Haleigh Summers received the Manjit K. Misra scholarship along with the ISA award. Catherine Leafstedt was the recipient of the American Seed Trade Association Scholarship. Kathryn Hoemann received the ISA Bill Latham Scholarship. Rebekah Arnold from Pocahontas, IA, daugter of Jeffrey and Susan Arnold. Rebekah is a senior majoring in Agronomy with Seed Science as a secondary major. She successfully completed an internship as the first female operations intern at NEW Cooperative and earned the admiration and respect of her coworkers for her work ethics and disposition. She also completed a research project for the parent seed production group at Syngenta where she analyzed on the effect of planting density in corn on number of heat units required from silk to anthesis interval. Rebekah is passionate about giving back to her community. Kelsey Baumhover of Carroll, IA, daughter of Dave and Patty Baumhover. Kelsey is a senior majoring in Agronomy with Seed Science as a secondary major. Her career goal is to use “her knowledge and passion for agriculture and her love of science to benefit crop production while making a positive impact on agriculture”. She will achieve this goal while conserving our natural resources and helping small farmers “like her father”. She is an internship with the vegetable seed research group at USDA North Central Plant Introduction Station. This spring, Kelsey will conduct a research project on root development of wild carrots growing on different environments. Anthony Moellers of West Union, IA, son of Jason and Lori Moellers. Tony is a senior double-majoring in Agronomy and Seed Science with a minor in Ag Business. He grew up on his family farm, and his passion for the seed industry stems from his experiences at FFA, AFA and his father work with Stine Seed Company. He has held several agronomy sales’ internships with Farmers Cooperative Company, Mycogen Seeds and Dow AgroSciences and this summer plans to return to Mycogen Seeds as an intern. Jamie Pokorny of Clutier, IA, daughter of Mark Pokorny. Jamie is a senior in Ag Studies with a minor in Agronomy. She has worked for 4 years as detasseler and roughing off-type plants in seed production fields, worked as crop scout for 3 years and a safety technician at DuPont Pioneer Hi-Bred International Inc. She has helped plan the Annual CALS’ Beginning Farmers Network conference and is a member of the Agronomy Club, Ag Business Club and ISU Iowa Corn Association Club. Jamie plans to work for a local Coop as an Agronomy sales rep. Her long-time career goal is to become a research agronomist, where she can work in seed production and distribution. Lucas Roberts of Trivoli, IL, son of George and Nancy Roberts. Lucas is a senior double-majoring in Agronomy and Genetics. He grew up on his family farm in central IL, and has a personal seed collection, specifically different corn varieties. He had an internship as field and lab assistant with ISU Hufford Lab in Ames and is teaching assistant for the ISU Department of Agronomy. Lucas is a member and teaching assistant of the ISU Agronomy Collegiate Crop Team and received 1st place individual in crop and weed identification at the 2014 Kansas State University Crops contest. Sarah Striegel of What Cheer, Iowa, daughter of Michael and Suzette Striegel. Sarah is a senior double-majoring in Agronomy and Agricultural Education with a minor in International Agriculture. She grew up in a small family farm raising corn, soybean and livestock. She was in the top 2% in CALS academically during her freshman year, and had been in the Dean’s list for 4 semesters, and in Iowa State’s Honor Program. Sarah was soybean seed production intern with DuPont Pioneer, and will be a seed corn production intern with Monsanto on summer 2016. She was undergraduate research assistant at ISU in a project that investigating the impact of pre-collegiate and collegiate experiences on student leadership. Catherine Leafstedt (2015 ASTA scholarship winner) of West Des Moines, IA, daughter of Jon and Carla Leafstedt. Catherine is a senior majoring in Agronomy. She has research experience at Dupont Pioneer where she worked on a project assessing the physiological recovery of corn plants under nutrient deficiency stress; and was a seven-month corn breeding intern at Monsanto where she evaluated the morphological and physiological characteristics of corn inbreds and hybrids with ear rot resistance. She traveled with a World Food Prize International Internship program to the international Potato Center in Peru where she conducted research on root architecture in response to drought stress. Haleigh Summers (Manjit Misra Outstanding Senior Scholar) of Urbana, IL, daughter of Tim and Jessica Summers. Haleigh is a senior double-majoring in Agronomy and Seed Science. While at ISU she has been on Dean’s list for 5 semesters, and has worked in the ISU Plant Transformation Facility maintaining corn cell cultures for transformation, has conducted undergraduate research at Pat Schnabel’s lab, and has been a plant breeding intern for Beck’s Hybrids in Marshalltown, IA, where she lead her own 12-person pollinating crew. This summer she will return to Beck’s Hybrids for an internship in product development and sales. Her excellent academic performance has been rewarded with several scholarships. 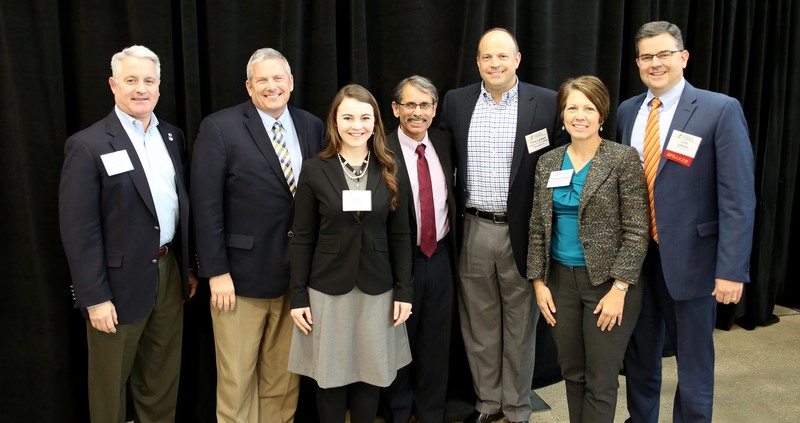 Pictured above left to right: Adrew LaVigne, American Seed Trade Association, Iowa Secretary of Agriculture Bill Northey, Kathryn Hoemann, Dr. Manjit Misra, Iowa State University Seed Center and Iowa Seed Association Ex-Officio, Chris Latham, Shannon Latham, John Latham. Kathryn Hoemann (Bill Latham scholarship winner) of Clive, IA, daughter of Jeff and Ann Hoemann. Kathryn is a senior majoring in Agronomy and Genetics. She declares herself passionate about plant breeding. Kathryn is a TA for the introductory Agronomy course and participated in the ISU Honors Program Research program where had the opportunity of utilizing high-throughput PCR and electrophoresis methods to analyze the success of transposable element insertion in mutagenized maize. She has completed internships with Monsanto, and Dupont-Pioneer, and was undergraduate research assistant in the sorghum breeding program where she led a sorghum pollination crew. For further information, please contact ISA executive director Joan O’Brien by phone at 515.262.8323 or via e-mail at joano agribiz org (joano agribiz org) .